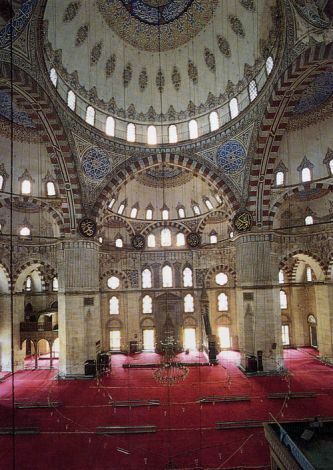 In Anatolia, cradle to many civilizations, there is a rich heritage of water culture, of which Istanbul provides some of the most remarkable examples. From ancient times into the sixteenth century water was allowed to flow freely from fountains, the water pouring out of stone gargoyles in the form of plain spouts or carved animal heads. But the expense of supplying water and its increasing scarcity prompted the search for a convenient way to control the flow, and so prevent this valuable resource running to waste. For this purpose an early type of tap known as a burma lüle, in the form of a rod cut like a screw, was developed. When twisted into the pipe these screw taps cut off the flow. Their use commenced during the reign of Süleyman the Magnificent in sixteenth century, but met with strong opposition from the water carriers, as we see from an edict issued by the Sultan to the kadi (judge) of Istanbul asking that measures be taken to prevent the vandalism of taps. Taps were at first cast from bronze and later from brass, which was cheaper. While some were plain in form others were made in ornate shapes with engraved decoration. For the palace and other important buildings, taps were made of silver, silver alloys or gold plated bronze, and richly decorated in various techniques such as engraving, openwork and chasing. 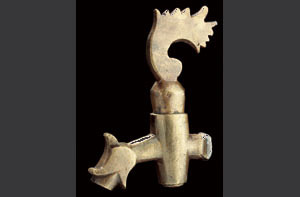 The wide diversity of Ottoman tap forms include heads of animals, such as snakes, dragons and rams, and geometric and floral shapes. All reflect the tastes and styles of architectural decoration of the period. During the 18th and 19th centuries taps made for outdoor and indoor use at palace buildings and mansions became so elaborate that their function was subservient to their decorative role. Some early examples to brass taps are provided below.